SmartHub is NortheastTels free online bill payment system. SmartHub is easy to use and provides you with more than just a payment option. It lets you manage your account through a personal computer, smartphone or tablet. Enroll in SmartHub using your NortheastTel account number on your bill (as of February 2017). If you do not have that number just give our office a call at 318.874.7011 and we will get that information for you. Once enrolled you will be able to explore the many services and information SmartHub has to offer. Click here for SmartHub FAQ’s. Sign up for Paperless billing and Autopay. 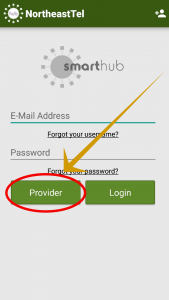 Sign up for SmartHub Mobile App! Sign up from your Web Browser! Visit your phone’s app store and download the SmartHub App by searching for Smarthub. Once the app is downloaded, you will be prompted to search for your power service provider. 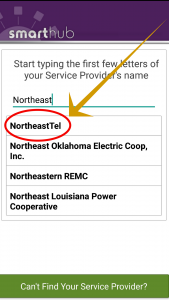 Type in “NortheastTel” and confirm. To register, you will need to enter your account number on your bill, the last name on your account, and an email address. You’ll also need the mailing zip code or amount of your last bill. Once you’ve registered your account, log in to the NortheastTel SmartHub app. There you will see a variety of services offered including billing history, payment options and much more! Visit the SmartHub login page. You can access it from the home page in the top navigation bar “Pay Bill” it is also located at the top of every page. Log in using the temporary password provided in the registration confirmation email you receive and set your own password. Be aware that passwords are case sensitive. After you have enrolled, you’ll use the same email address and password each time you login. The security phrase will be required to complete a number of processes in SmartHub. 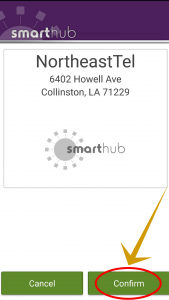 If you should need further assistance navigating through the SmartHub app or SmartHub web browser portal, give our office a call at 318.874.7011 during normal business hours.